Since 1964,1 we’ve taken for granted that all congressional districts contain more or less the same number of people: as of the 2010 Census, 710,767 people on average. The idea is that every person’s vote in elections for the U.S. House is worth about the same amount. There’s one important catch, though: That assumes that every person in the district votes, but that just doesn’t happen. In fact, turnout can vary pretty dramatically among congressional districts, which is one reason that the partisan breakdown of seats in the House doesn’t necessarily match the results of the national popular vote. The way this usually unfolds in practice, at least in midterms, is that fewer votes are cast in Democratic districts than in Republican ones, which works in the Democrats’ favor. Simply put, if you live in a district with fewer voters, your vote makes up a bigger share of the total — which makes your vote worth more — and it takes fewer votes to carry the district. So while Democrats may win solidly blue districts with relatively few total votes, GOP candidates are more likely to run up the score in reliably Republican districts, winning by huge margins. In both cases, all votes beyond the 50 percent mark are “wasted” (after all, no matter how much you win by, you can only win one seat per district), but the size disparity means that more votes are wasted in bigger, redder districts. But those votes still count toward the national popular vote, making it theoretically possible for Republicans to win the national popular vote but still lose majority control because Democrats got more bang for their buck — or, in this case, votes. There are two reasons that Democratic districts generally have lower vote totals than Republican ones. First, a district’s total population is not the same as its voting-eligible population. The voting-eligible population excludes people under the age of 18, noncitizens and disenfranchised felons — in other words, people not eligible to vote. And districts with lots of ineligible voters (think urban and heavily Hispanic areas) tend to lean Democratic. There are 194 districts that are more Democratic-leaning than the country as a whole (according to FiveThirtyEight’s partisan lean metric2), and they have an estimated median voting-eligible population of 497,339 people; the 241 districts that are more Republican-leaning than the national average have an estimated median voting-eligible population of 528,109 people. 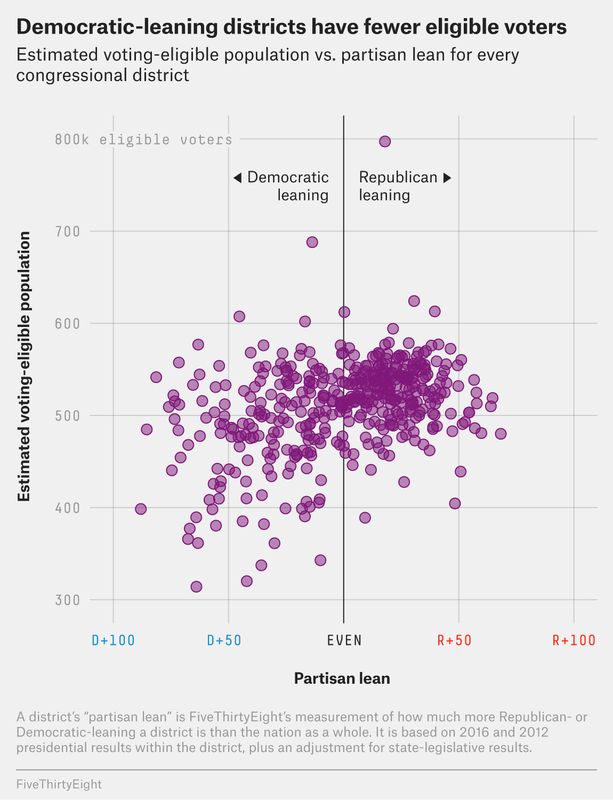 The chart below plots each district by its voting-eligible population and partisan lean; notice how Democratic-leaning districts have a wide range in the number of eligible voters — anywhere from 314,170 to 688,024 — while Republican-leaning districts generally have from 450,000 to 600,000 eligible voters (although there are a few outliers). Of the 50 districts with the lowest voting-eligible populations — places like East Los Angeles — 43 lean Democratic. Of the 50 districts with the highest voting-eligible populations — places like Montana — 34 lean Republican. So Democrats are winning more districts that have lower voting-eligible-populations. The second reason is that not every eligible voter actually votes — nor do they all turn out at the same rate. White, older and better-educated people all turn out at very high rates, while younger people, Latino people and those with less than a high school education are less likely to vote. The lower a district’s voter turnout is, the more likely it is to be Democratic-leaning. As of Sept. 28, our House forecast predicted a median turnout of 208,558 in Democratic-leaning districts. Republican-leaning ones had a median predicted turnout of 238,520. 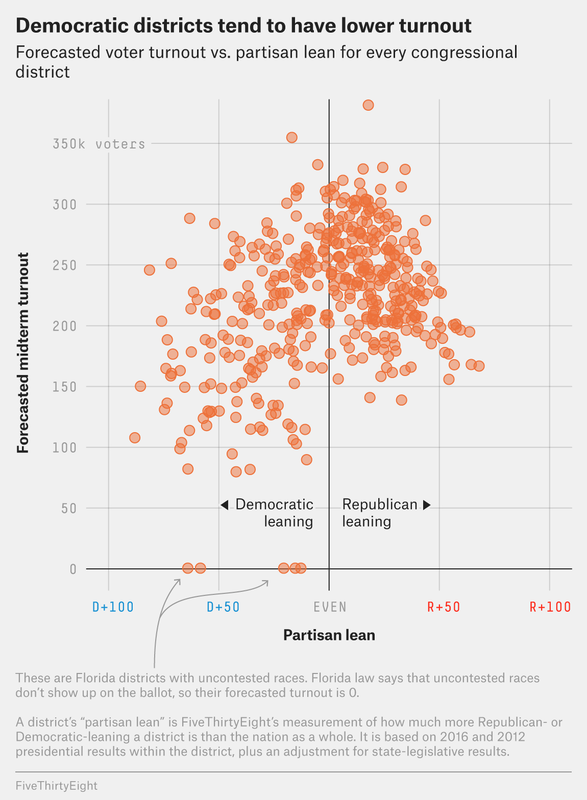 The chart below shows the relationship between partisan lean and predicted turnout; as you can see, fewer voters tend to show up in Democratic-leaning districts. Of the congressional districts being contested by both major parties this year,3 the 50 with the lowest predicted turnout include 38 Democratic-leaning ones and 12 Republican-leaning ones. By contrast, 39 of the 50 districts with the highest predicted turnouts (all of which are contested by both major parties) are Republican-leaning. It’s yet more evidence that fewer votes tend to be cast in Democratic districts than in Republican ones. But let’s not get carried away: An imbalance in voter turnout probably isn’t a strong enough force to hand Democrats a majority of House seats while the party loses the national popular vote (at least not this year). Overall, Republicans still have a strong structural advantage in the House thanks to the effects of gerrymandering and geographic sorting.4 But this hasn’t stopped some conservatives from arguing that districts should be drawn based on the population of eligible voters, not total population. This would give rural districts, which are generally Republican-leaning, more power than they have now, since they tend to have a higher percentage of citizens and a lower percentage of children in their populations than Democratic-leaning urban areas. One major hurdle? States lack reliable data on how many eligible voters there are (the voting-eligible population numbers used in our analysis are our own estimates). That’s why some believe that the Trump administration’s push to add a question about citizenship to the 2020 Census may be an entree to redrawing districts based on the number of eligible voters. So keep an eye on this seemingly overlooked distinction; it could emerge as the major fight in the next round of redistricting. When the Supreme Court decided Wesberry v. Sanders, which ruled that congressional districts should be proportional. Before that, some congressional districts were two or three times larger than others, and states did not always redraw their lines after every census. The average difference between how a state or district votes and how the country votes overall. In our new and improved partisan lean formula, 2016 presidential election results are weighted 50 percent, 2012 presidential election results are weighted 25 percent and results from elections for the state legislature are weighted 25 percent. Districts without a Democratic or Republican challenger (including districts where both general-election candidates belong to the same party) complicate things. This year, Republicans failed to get a candidate on the general-election ballot in 39 congressional races, while Democrats missed the ballot in only three, so you might expect that would artificially inflate Democrats’ popular vote total — but it’s not that simple. Uncontested races typically have much lower voter turnout, which can depress the winning candidate’s vote total. There’s also a quirk in Florida law that says that uncontested races don’t appear on the ballot at all, so we forecast turnout in those races as zero. The phenomenon whereby Democrats tend to cluster in cities (i.e., in already heavily Democratic precincts) while Republicans dominate rural areas (i.e., already heavily Republican precincts).